Come visit award-winning Pirate’s Cove–the ultimate family attraction in Williamsburg! 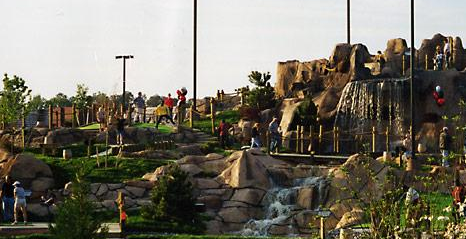 We are Williamsburg’s premier miniature golf course, the only place for adventure and tales of true pirate lore. Putt your way through the world of 18th century buccaneers–through mountain caves, over footbridges and beneath cascading waterfalls! Our two award-winning courses are designed to provide pure delight for kids and adults alike–the ideal family activity. Sunken ships, authentic pirate theming, gorgeous waterfalls, meandering streams, pirate exploits, lavish landscaping and friendly service all await you. And Mates, beware of stray cannon fire, lofted from the renegade pirate on his floating raft!! Come see why customers who travel the nation say, "This is our favorite Pirate’s Cove in the country!!!" DISCOVER THE FUN! Call ahead for hours before Memorial Day and after Labor Day. From I-64 East, take exit 232. Go to 199 and exit on Mooretown Road East. From I-64 West, take exit 238. Turn left at the end of the ramp, go to the second stoplight and turn right onto Route 132. Go to the next stoplight and turn right on Bypass Road. Pirate’s Cove is on the right.